When I was a small child, croissants were my all time favorite – decent bread. Not only crunchy, croissants are buttery, flaky and tangy baked things that can expand all my nose’s neuron. :D. This kind of blatantly-delicious bread is the combination of puff pastry and yeast. Not so difficult, isn’t it? These croissants in the picture I stuffed them with ham and salami, so they don’t have the crescent shape as usual. I luckily had this recipe from a French website (unfortunately forget its name to give it the credit) and modified it to have the best flaky croissants. This recipe has more butter than other ones, it yield a more butter-flavored bread, however. – Sprinkle the yeast into a 1/2 cup of lukewarm milk dissolved 1 tsp of sugar. Let it sit until it bubbly foams. – Cut the dough a plus right at the centre of the dough to make the gluten rest. Let your dough sit in the refrigerator overnight. – Arrange four sticks of butter adjacent to each other. Use a rolling pin and pop them until it spreads. Then use your hand to fold the butter into a square, press it to form a uniform butter. – This butter block has no flour as other recipes. You don’t like a croissant that is full of flour smell, do you? – Tomorrow morning, roll you dough into a square that is double sized the butter. – Place the butter block into your dough square and fold it in. Make sure your butter block is fully covered by the dough, otherwise it would be shredded and butter would be out while you roll the layers. – Roll the dough into a rectangular (if you cannot, it’s okay as long as your butter is still in the dough). Fold each sides of the rectangular’s width toward the center until they meet each other. Fold again to have a small rectangular. At this time, you have 4 layers. – Let your dough sit in the freezer for 15 minutes. Your butter can be melt down faster in the summer so be careful. Each time you repeat the folding the same as the previous step. I folded my dough 5 times, so I had 4x4x4x4x4 = 1024 layers. Is it impressive? 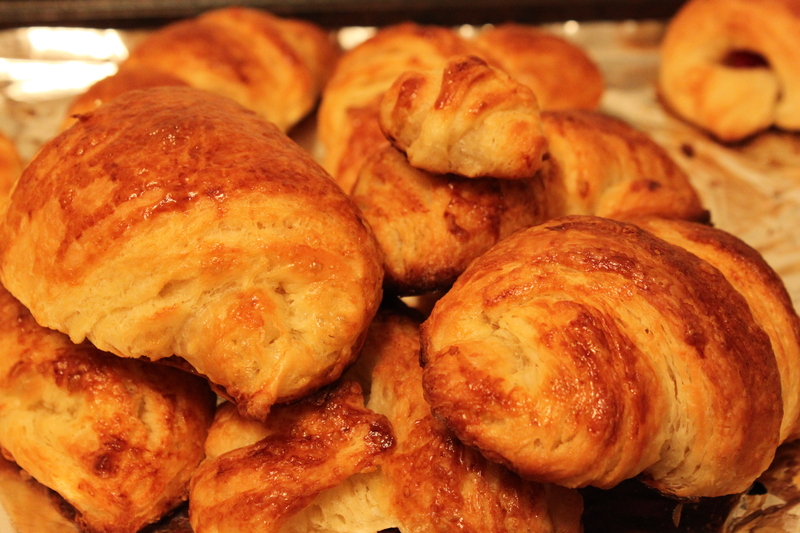 The more you fold the dough, the better flaky the croissant is ‘coz all the flour is absorbed by the butter. It also makes more layers, thus your croissant will be puffed better. – If you don’t want to use your dough right away, you could keep it in the freezer and thaw it 1 hour before baking. It works all the time. – Roll the dough into 1/5 inch thick. Cut the dough into triangle, make a short 1/4 inch notch at the center of the short side of the triangle. This notch will help the croissants curl into crescents as they should be. – Gently elongate the triangle. This move will make the croissants have more layers and tightly shaped as well. Using one hand to keep the top of the triangle and the other slightly rolling the triangle from the bottom to the top. – Beat one egg with 1 tsp of water to make egg wash. Brush your egg wash onto the surface of the shaped croissants. Remember to place each 3cm away from others because the croissants would be risen in 1-2 hours. You should wait until they are totally double sized. 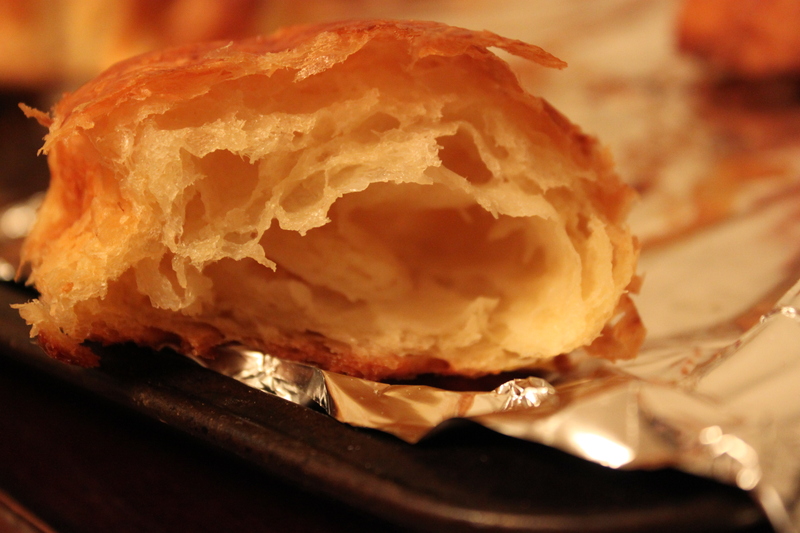 At this time, you could see the croissants have many layers. Really worth your works. – Brush again the remaining egg wash onto the croissants. – Preheat your oven at 370 F 15 minutes before baking. It’s not necessary to spray your anti-sticky oil to your baking sheet due to your croissants have enough butter to prevent them from sticking. So economical when making yourself croissants!!! – Bake the croissants in 20 minutes or until golden brown. They should be served warm to retain their crispiness but still be reheated well next day, however.